I'm so excited to finally share my vegan lavender ice cream recipe with you! Even more exciting, I checked off three huge goals off my 101 in 1001 goals list. I didn't think I would get to do all three in three days and was scared to take the leap. But I decided to embrace the challenge and take the plunge. Here are the three projects I completed this week. It was a month ago when I started thinking about creating my own YouTube channel and posting videos of my vegan food creations. I finally got to accomplish that goal! I was so excited to about my first lavender recipe that I decided to record it on video. I'm thrilled to share the first video of my homemade culinary creations! The video was recorded last week but edited yesterday. Kerwin was at work, so everything was recorded either with my camera on the tripod or with my one available hand. While in the middle of editing the video yesterday, I couldn't bring myself to use stock music. I found one online, but it just didn't set the right mood or emotion for the video. So I paused, went to the piano, and recorded my soundtrack. I used three tracks for the soundtrack: two for the piano and one for the accordions. My plan is to compose and record the soundtrack for all my upcoming YouTube food videos. I love having full control of the look, feel and sound of my videos without having to worry about whether or not it is legal to use them.I was surprised by how much fun it was to capture and express exactly how I felt about the food I was making. I listen to Italian instrumental music when I cook (it inspires me to get creative in the kitchen), so it was only natural for this soundtrack to remind me of Italy. Coming up with the name for the soundtrack was easy. There was no question about it! I fully embraced my inspiration and decided to called it the "Lavender Waltz". Here's my the vegan lavender ice cream video with the Lavender Waltz soundtrack. At least 24 hours before churning, place your ice cream churning bowl in the freezer to chill. It should be frozen solid before using (you shouldn't hear liquid sloshing inside when you shake it). See the Notes section if you don't own an ice cream maker). Food coloring. To make your natural food coloring, add the torn red cabbage leaves to 2 cups of boiling water and let it simmer in medium-low heat for ten minutes. Stir occasionally with a silicon spatula (you'll want to avoid using wooden spoons to prevent staining). Let the liquid reduce until it turns into a rich, dark purple color and a little over half of the liquid is left. A couple minutes before turning off the heat, add 1/2 tsp of the lavender buds. Stir occasionally and simmer for three minutes then turn off the heat. Set the liquid aside to let the lavender steep. Ice cream. 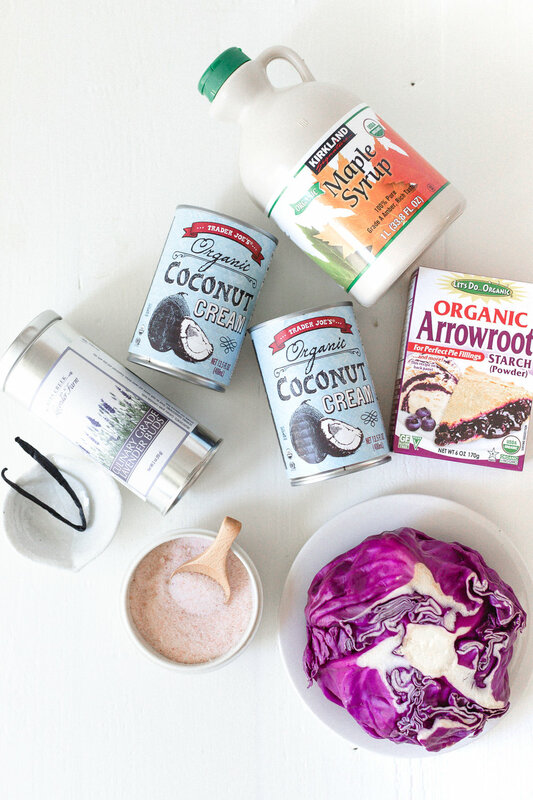 Pour the coconut cream, plant-based milk, liquid sweeter, scraped vanilla bean, vanilla extract, salt and arrow root to a high-speed blender and blend on high until completely creamy and smooth for 1 to 2 minutes. Add more liquid sweetener if it needs more sweetness. Pour the mixture into a saucepan. Using a spoon, gradually add the liquid food coloring to the ice cream base. If the liquid is still not to your liking after using all the liquid, add a few of the cabbage leaves to the base. It will add more color to the mixture. Heat the saucepan slowly and stir continually. Let it simmer on medium-low heat until you have a puddling-like consistency. And avoid boiling. Strain the liquid while pouring it into a cooling container. Once completely chilled, pour the mixture directly into the chilled ice cream maker and churn according to manufacturer’s instructions — about 30 minutes. It should look like soft serve. Once churned, transfer the ice cream to a large freezer-safe container (such as a loaf pan) and use a spoon or spatula to smooth the top. Cover securely and freeze for at least 4 to 6 hours or until firm. Set out for ten minutes before serving to soften. A hot ice cream scoop also eases scooping. Coconut ice cream melts a little more quickly than milk-based ice creams, so don't wait too long! Will keep in the freezer for up to 10 days, though best when fresh. Pairs perfectly with vanilla, raspberry-orange and lemon cookies. Optional mix-ins: raspberry or strawberry chunks or puree. What is your favorite ice cream flavor? Click here to let me know! Karla is a grateful wife, homemaker, songwriter, photographer and brand designer. She is a passionate advocate for intentional living. She loves writing about her adventures in country living and enjoys sharing plant-based recipes from her home sweet country home.